Point Park University M.B.A./M.A. in media communication student Stephanie Mueller won the Meeting the Challenge of Ethical Leadership Essay Writers Forum Nov. 13 with her presentation on Rosalind Brewer, president and CEO of Sam's Club and the first woman and first African-American to lead a Walmart division. Mueller will receive a $500 prize for her essay "Ethical Leadership: Rosalind Brewer." New to the event this year, students in the Organizational Behavior and Ethical Leadership and Sustainable Organizations M.B.A. classes were asked to write essays addressing the question, "What values and best practices make a leader ethical and effective?" while highlighting a leader they admire and respect. Jason Kirby, D.O. : "Dr. Andrew Taylor Still, M.D., D.O., Founder of Osteopathic Medicine"
Megan Kuntz, "Ethical Leadership and Angelina Jolie"
Mark E. Murray: "The Hybrid Design: Delivering an Ethical Sustainable Learning Organization and General James Doolittle"
"I enjoyed having the opportunity at the event to further explain my point of view," remarked Kuntz, who is concentrating her M.B.A. degree in international business. Essays were judged by event co-facilitators and panelists Tim McGuire, Ph.D., Point Park University trustee and senior executive vice president, chief analytics officer and vice chairman of Management Science Associates, Inc., and Robin Connolly, Ed.D., Point Park University trustee, chair of Point Park's Academic and Student Affairs committee and senior vice president of human resources for PNC Financial Services. Following the student presentations, McGuire and Connolly led a discussion on ethical leadership with the audience. "The most intriguing lessons I took away from the panel discussion were Tim McGuire and Robin Connolly's points about the values that create an ethical leader," explained Chynna Carter, an M.B.A. student concentrating in health systems management. "It was very helpful to gain insight on ethical leadership from business professionals who are leaders as well." "This was our best event yet because students could discuss their research about what constitutes ethical leadership and sustainable organizations. It is what we teach at Point Park University," remarked Haley. 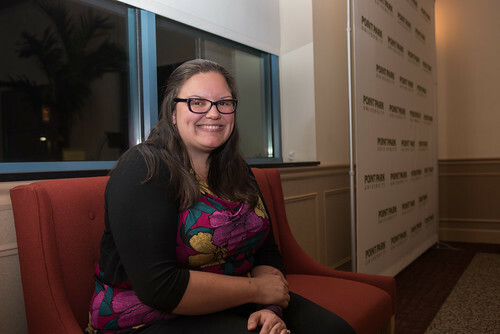 Kuntz added: "My favorite part about being a graduate student at Point Park is having the opportunity to connect with my professors and build strong relationships with them." For more information, visit the YouTube channel for the Ethical Leadership and Sustainable Organizations course at Point Park.